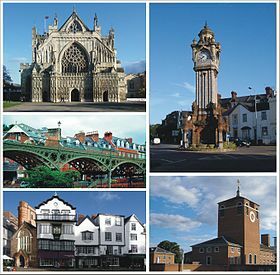 Clockwise: The Cathedral, The Clock Touer, Devon Coonty Haw, Cathedral Close, The Airn Brig. Exeter ( i/ˈɛksᵻtər/) is a historic ceety in Devon, Ingland wi a population o 129,800 (mid-2016 est.). Exeter is twinned wi Rennes in Fraunce, Bad Homburg in Germany, Yaroslavl in Roushie, an Terracina in Italy. ↑ "Standard Area Measurements (2016) for Administrative Areas in the United Kingdom". Office for National Statistics. 1 February 2017. Retrieved 9 February 2017. ↑ "Population Estimates for UK, England and Wales, Scotland and Northern Ireland, Mid-2016". Office for National Statistics. 22 June 2017. Retrieved 27 June 2017. ↑ "Ethnic Group, 2011". Office for National Statistics. 30 January 2013. Retrieved 18 July 2013. ↑ "Town twinning". Exeter City Council. Retrieved 16 September 2012. This page wis last eeditit on 11 Mairch 2018, at 17:07.